Java Multithreading, Doing some work or process is called Thread. Multi Threading is nothing but process of managing and executing multiple tasks at a time. Before discussing more about user has to learn the terminology as follows. Multitasking is the process of executing more than one task at a time. Java Multithreading is the process executing multiple threads at a time. Multiprocessing is same like multitasking, but it involves more CPU’s. Parallel Processing is nothing but using more CPU’s in one system. Java Multithreading, While starting any thread, thread can be any one of the state as follows. According to sun micro thread life cycle only follows 4 states, for the better understanding purpose Running state is also added. New: When creating an object to the Thread class then thread will be in New state, but this process will be started before invoking start(). Runnable: The thread is in runnable state after invocation of start() method, but the thread scheduler has not selected it to be the running thread. Running: Thread is in Running state if thread scheduler selected it. Non-Runnable(Blocked):Here some methods will be performed like sleep(). Terminated: Thread goes to dead state after the completion of task. Developer can create the thread in two ways as follows. Java Multithreading, Following is an example to create a Thread by extending Thread class. Where developer provided method called public void run(), this needs to be used. To start the thread developer has to use start(). Following is an example to create a Thread by implementing the Runnable inerface . Java Multithreading, The difference between extends Thread and implements Runnable is that once if the developer declare the extends then there will be no scope to extend other classes, but it is possible in Runnable interface. Java supports single inheritance so user can only extend single class. Using the Runnable instance to encapsulate the code which should run in parallel provides better reusability. User can pass that Runnable to any other thread or thread pool. When user extends Thread class, after that user can’t extend any other class which required. When user extends Thread class, each of thread creates unique object and associate with it. When user implements Runnable, it shares the same object to multiple threads. 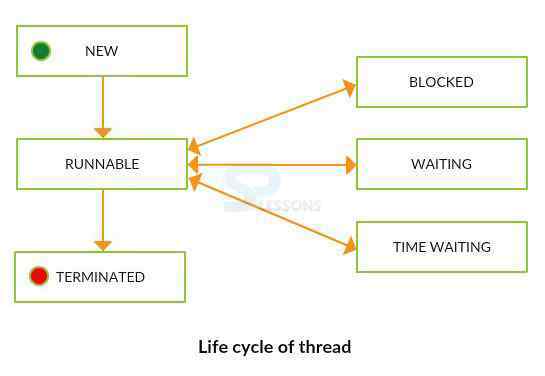 Java Multithreading, If a thread is acting on any object and preventing another thread to act upon the same object is called Thread Synchronization, it is used to remove consistency problem. Following is an example which describes the problem with synchronization and with out synchronization. MyThread1 t1=new MyThread1(obj);  //created object for MyThread1 class. MyThread2 t2=new MyThread2(obj);  //created object for MyThread2 class. t1.start();  //through an object thread will be started. Where developer did not use synchronized method so when compile the code result will be as follows. Once place the synchronized before void printTable(int n) result will be as follows. Priorities are spoken to by a number in the vicinity of 1 and 10. In most of the cases, thread schedular plans the threadas indicated by their priority. In any case, it is not ensured in light of the fact that it relies on upon JVM determination that which booking it picks. The following are the three priorities of thread. Daemon thread in java is a service provider thread. Synchronization is used to prevent thread interference.